Rikki was a sickly Golden Retriever pup when she found a home with Chuck and Patty Mitchell of Tallahassee, Florida, after the Mitchells opened their home to dogs who had survived Hurricane Katrina. They saw that Rikki had eating problems, soiled her cage, and was afraid of loud sounds and rain. With Chuck and Patty’s care, Rikki overcame Katrina’s travails and the experiences of multiple animal shelters. After her obedience training, the Mitchells knew that Rikki preferred human interaction over dog fun. Her keen sense of human emotional needs and Chuck’s guidance helped her to train as a courthouse therapy dog. Under Chuck’s supervision, Rikki comforted sexually-abused children as they described their ordeals in Florida courts. While Zoe’s case was a first in Florida, it was the beginning of more jobs for Rikki. She became a Reading Education Assistance Dog (READ), and with Patty Mitchell, helped children boost their reading skills in Florida’s Leon County schools. Rikki’s patience and lack of criticism made her an attentive listener to whom the children like to read. According to the author, being with a calm dog lowers a child’s blood pressure, heart rate, and anxiety. 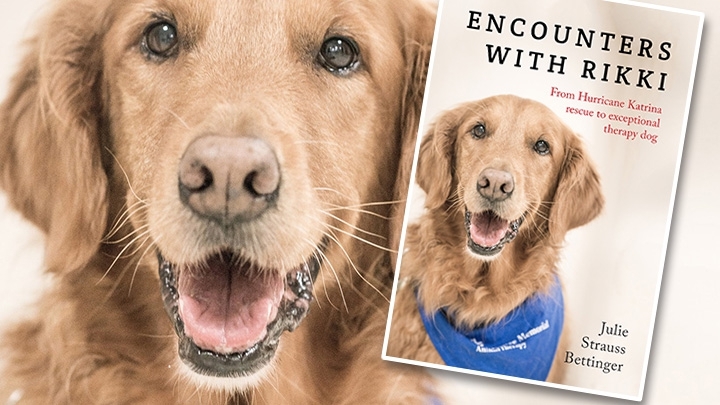 Encounters with Rikki: From Hurrican Katrina Rescue to Exceptional Therapy Dog is sometimes hard to read due to the abuse descriptions warned of before the story begins. Despite those difficult passages, Julie Strauss Bettinger has written a winner about the social bonds disparate beings create and how all are better because of them. Encounters with Rikki will be published January 26.